Swiss Eagle themes has been purchased 58, rating: 5/5 based on 3 reviews. 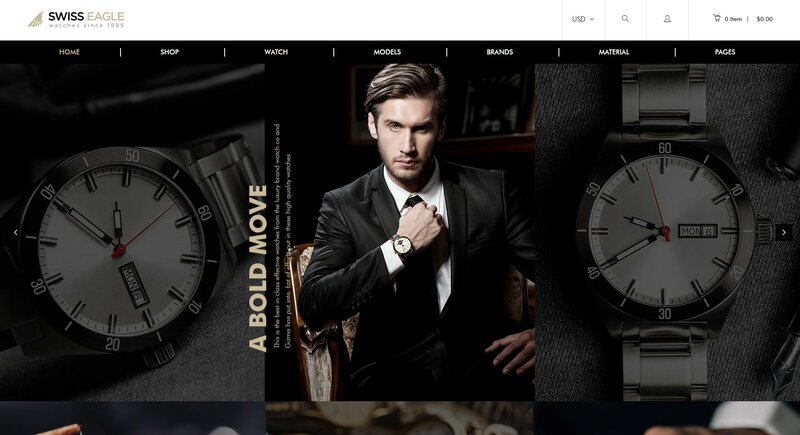 Swiss Eagle is an excellent Shopify theme designed exclusively for watches shops. Developed by BuddhaThemes, Swiss Eagle has a clean and modern design that catches the eye at first sight. In addition, this theme is fully compatible with all devices such as mobiles, tablets, computers, laptops, screens, etc. Moreover, Swiss Eagle Shopify theme includes a lot of powerful modules to help your customers have a great experience on the website. In particular, it is based on CSS 3, HTML 5 technology, which makes it easy for shop owners to use and customize quickly.